Occasionally, the Office of Alumni Relations will offer special discounts or services with outside groups which are available to our Alumni and Friends. Current offers are listed below. 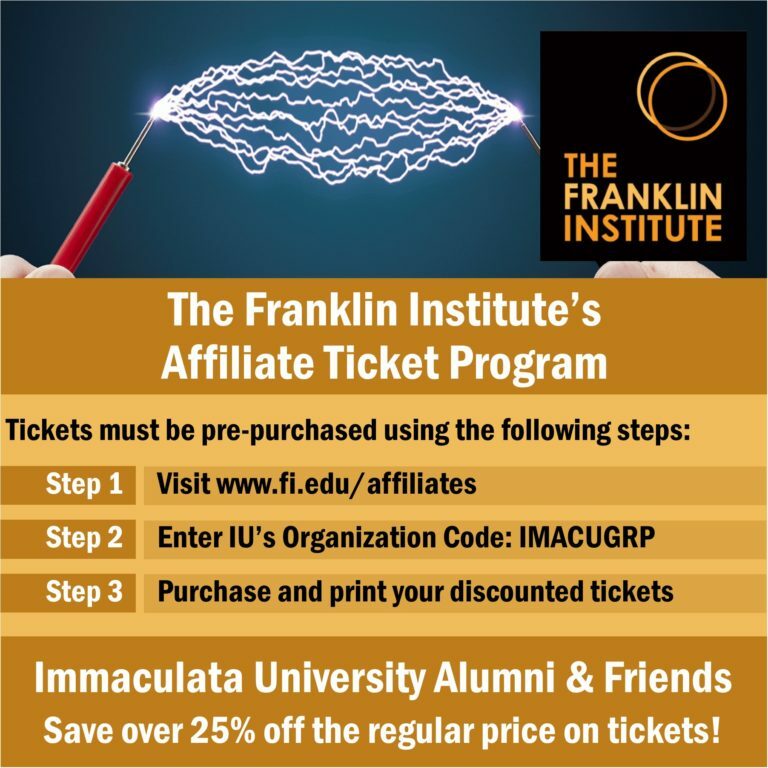 This program allows you to purchase tickets to The Franklin Institute at a savings of more than 25% off the regular price. Tickets are available for museum admission, special exhibits, and IMAX films, and will be purchased for specific dates/times. To take advantage of the offer, tickets MUST be purchased online through this website: www.fi.edu/affiliates. You will be asked to create a user account, and will then enter Immaculata University’s Organization Code: IMACUGRP. Once you have selected and paid for your tickets, print them and take them to The Franklin Institute on the appropriate date & time. Questions regarding the program should be directed to Melissa Fleming at The Franklin Institute: 215-448-1387 or email mfleming@fi.edu. The Immaculata University Alumni Association has partnered with Meyer & Associates to offer an Alumni Insurance Program as a service to alumni. The program offers a variety of attractively-priced insurance products, most of which are available to alumni, students, faculty, and staff, as well as their spouses, domestic partners, children, parents, and siblings. Life Insurance: Long-term protection with great rates and fantastic features. Coverage is available from $10,000 to $50 million. Travel Insurance: Travel Medical and Trip Protection coverage is available for individuals or groups, for personal or business travel. Long Term Care Insurance: Protect your assets from serious erosion while allowing access to quality care in the most appropriate and desirable setting. Pet Insurance: Simple, customizable dog and cat insurance plans are available. Special Event Insurance: Liability coverage up to $2 million is available for events lasting from a few hours to as much as 10 days. Dental Insurance (Coming Soon): Family dental coverage that provides a national network of dentists, online enroll- ment, and travels with you to any employer. ID Theft Protection (New): Protect yourself and your family against identity theft with a comprehensive solution you can count on. Small Business Insurance (New): We offer an all-in-one simple solution that includes a selection of plans, employee enrollment, and ongoing administration. Advisory Services: A licensed insurance professional is available, at no charge, to answer questions and provide customized guidance. For more information visit Immaculata.MeyerAndAssoc.com or contact our program administrator (Meyer and Associates) at 800-635-7801. Immaculata University receives financial support for allowing Meyer and Associates to offer this program.